We urge you to recall that we are a country of immigrants and recognize the valuable contributions immigrants bring to our communities and congregations. Pennsylvania policies should reflect those values and treat immigrants with the respect and dignity we all deserve. HB 1885 and its harsh rhetoric sends a divisive message and casts immigrants as threats rather than contributors to our communities. We also believe HB 1885 will erode trust between the immigrant community and local police and put our public safety at risk. Victims of crime and witnesses are far more likely to come forward when they are not threatened by the risk of being detained, deported and separated from their families. It is likely that HB 1885 will lead to liability issues for local law enforcement as well, as it did in Miranda-Olivares vs. Clackamas County in Oregon where a federal court found Immigration and Customs Enforcement (ICE) detainer holds unconstitutional and thus mandated a settlement. Likewise, in Lehigh County, Pennsylvania, Mr. Ernesto Galarza, a U.S. Citizen born in Puerto Rico, was wrongfully detained on ICE’s assertion that he was undocumented. Mr. Galarza won his case when the third district court ruled that local police are not required to honor an ICE detainer request and that Lehigh County shared in responsibility for violating Mr. Galarza’s Fourth Amendment and due process rights. HB 1885 would unfairly punish punish local police departments for not targeting immigrants simply for being undocumented. This bill serves only to spread fear, hate, and xenophobia, and would not make communities in Pennsylvania any safer. By reporting and detaining individuals solely because they are believed to be undocumented immigrants, HB 1885 would reverse years of intentional, community-based policing efforts that are vital to public safety in neighborhoods across the state. We believe that HB 1885 will create a more hostile environment for all immigrants and persons of color, which would lead to further discrimination and increased racial profiling, regardless of immigration or citizenship status. As we continue to raise consciousness about how our criminal justice system needs reform to stop targeting low-income communities of color, it bears noting that the Latino population is often unjustly profiled. 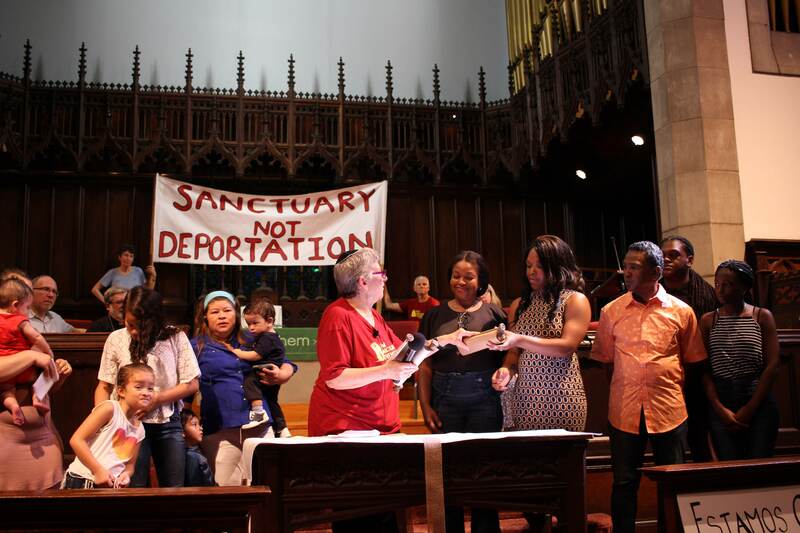 TRUST policies or “sanctuary” resolutions in which local police do not collaborate with ICE, do not prohibit immigrants from being prosecuted if they have committed a crime, as some have alleged. All individuals who commit crimes are charged and prosecuted just as in all jurisdictions. As faith leaders, we stand with the more than three hundred local jurisdictions that have chosen to limit their collaboration with ICE. We are confident that these common sense and widely used community policing practices result in greater public safety for all because of the trust they build between immigrant communities and law enforcement. It is because of the positive work of these communities and the concerns we expressed above that we ask that you oppose HB 1885. Sunday School Teacher Lilliana Estrada, Jehovah-jireh Pentecostal Church, Inc.
Rev. Burlington Latshaw, III, St. John’s Lutheran, Hamburg, Pa.